Stir up a few simple ingredients the night before and breakfast is waiting the next day! This version of overnight oats amps up the protein (and deliciousness) with a dollop of peanut butter. So handy to have a few jars of these waiting in the fridge – or, when we’re camping, the ice chest! This post is sponsored by Silk. This year, I’m partnering with Silk to create and share monthly ideas and recipes celebrating an Earth-friendly, plant-based diet and life – something I’m personally moving more and more toward. Ah, the great outdoors. Nothing gets you out there and, just, in it more than camping. Our family loves it. Often, people who love camping start out in tents when they’re younger, then upgrade and eventually find themselves in a big ol’ RV. But it’s actually been the reverse for us. 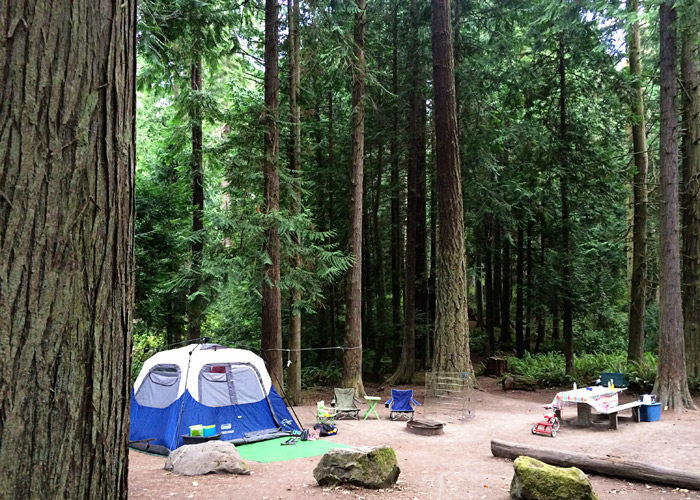 When our daughter was born, we owned a travel trailer – but we were too chicken to take an infant camping. So we sold the trailer. But after a couple of years, we missed camping! We lack the space for parking an RV at our current house, so last summer, we picked up a tent on a whim and headed to a nearby state park. I was a little worried about going back to basics, but armed with a couple of airbeds and and a sense of adventure, we had a ton of fun – our adventurous daughter most of all. The day we got home, I planned our next trip – and so it went. So I guess now we are officially tent campers! Once the issue of shelter was out of the way, I started thinking about vegan camping food. As fans of camping know, part of the fun of camping is the food! 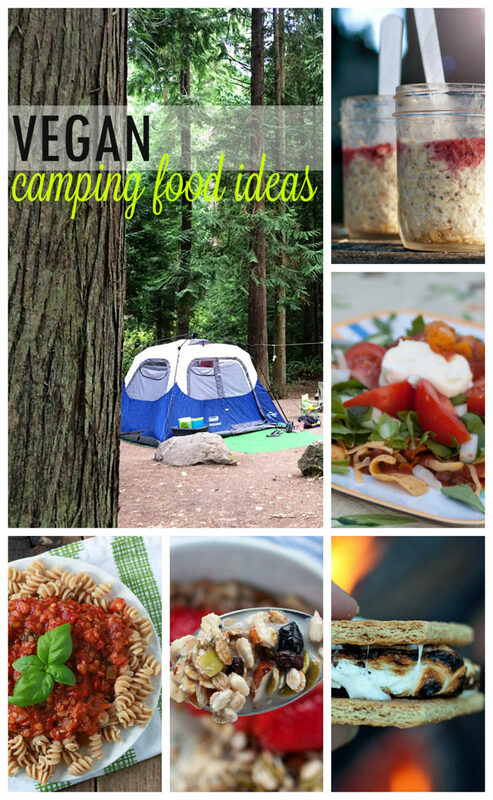 But for vegans, finding vegan camping food ideas that are easy to cook in camp can be a challenge. Campfires aren’t always allowed in campgrounds around here, so we often rely on our camp stove and portable grill to cook meals. But it’s way more fun to cook over the fire, so we’re trying to do that a little more. I’m not a vegan – I don’t eat meat or dairy, but I still eat eggs and honey – but when we went camping a couple of weeks ago, I challenged myself to go full-on vegan with my food. Leaving honey out was easy, but I had been relying on eggs for breakfast – so I had to come up with a few new ideas. My three favorite vegan camping breakfasts are oats (hot and cold), muesli, and tofu scrambles. The perfect vegan camping breakfast? Oatmeal! You already know oatmeal makes a rib-sticking breakfast – and it really is great for camping, especially vegan style. We cook up a big batch in a pot on our camp stove and serve it up with a selection of hearty toppings – nuts, seeds, dried fruits, fresh fruit, you name it. Even easier? Prepping several jars of overnight oats and keeping them in the ice chest for instant breakfast! Overnight oats are so easy – basically, you mix equal amounts of oats with your favorite milk (I use Silk Unsweetened Vanilla Milk) and whatever else you’d like in there. Refrigerate for a few hours and voila! Instant breakfast. 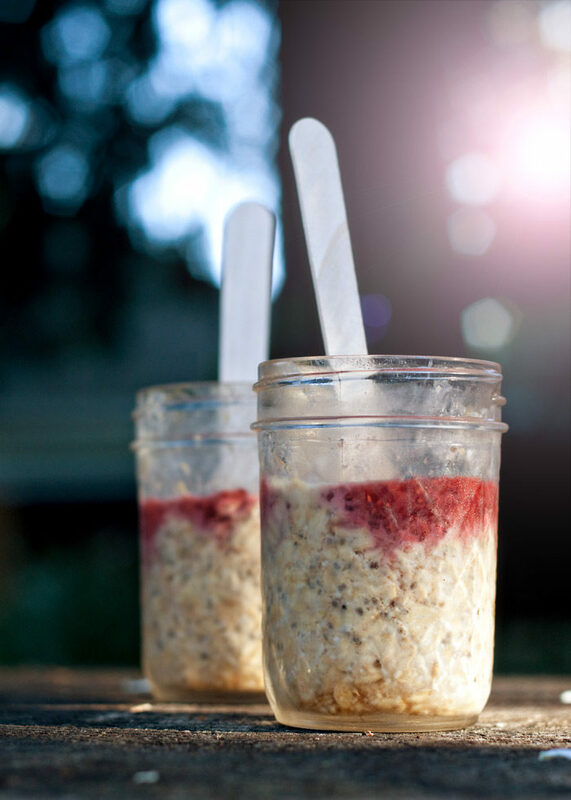 I love taking overnight oats camping, especially during warm summer months. It makes for a satisfying and delicious breakfast with no prep and one dish (well, jar) and spoon to wash – so easy. 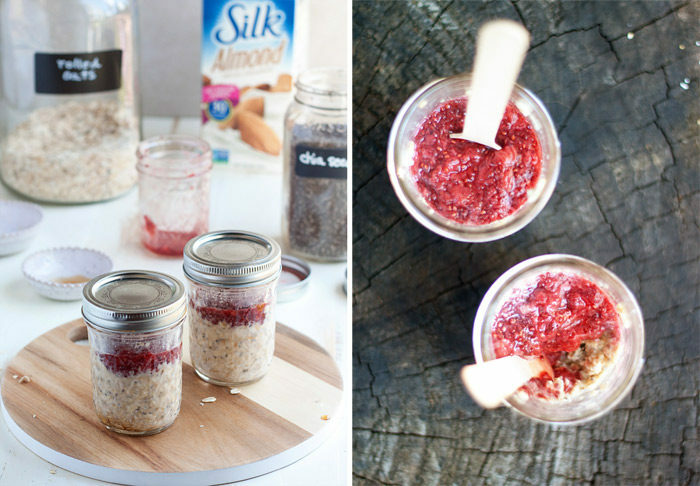 Scroll down for my favorite overnight oats recipe, PB&J Overnight Oats! 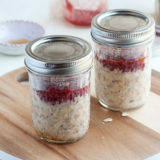 And here’s a great tutorial from Hurry The Food Up with info about How to Make Overnight Oats in a Jar + 28 Tasty Overnight Oats Recipes. Loads of good stuff! 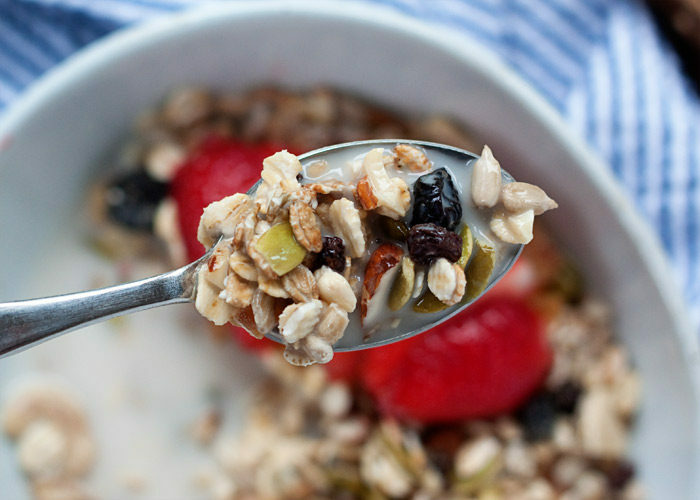 I sang the praises of muesli last month, and heck if I’m backing down now! With oats and other grains, nuts, seeds, and dried fruits, muesli – along with your favorite nut milk and a sprinkling of fresh fruit – makes for a hearty, healthy, and super-easy camping breakfast. I whipped up a couple of tofu scrambles during our last camping trip and I’ve gotta say, I’m sold. You can prep and season your tofu beforehand and keep it in an airtight container, or just do what I did and mash your tofu with a fork and add seasonings at the campsite (I cook mine on a cast-iron skillet over the campstove). 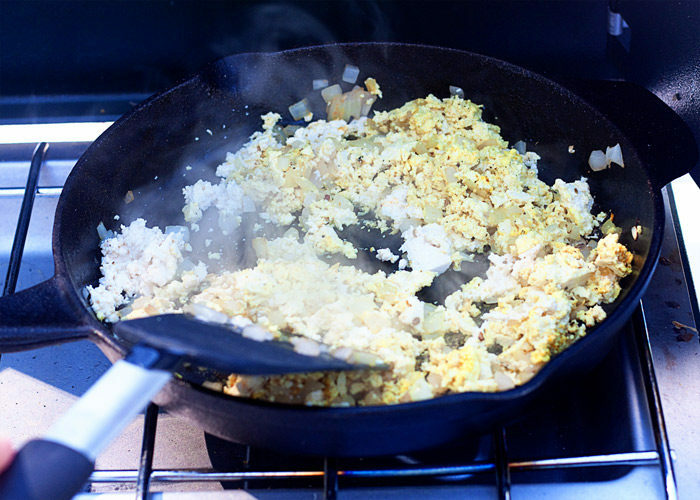 Tofu scrambles really are so easy. I like to saute a bit of onion, then add 1/2 a block of extra-firm tofu that I’ve mashed with a potato masher or fork. Stir in some salt, pepper, about 1/4 teaspoon of turmeric, and whatever other spices you like and cook, stirring frequently, over medium-high heat, for a few minutes. Toss in a few veggies if you like too. Done. Or bake up a batch of vegan doughnuts to pack up and bring along! Breakfast cookies! 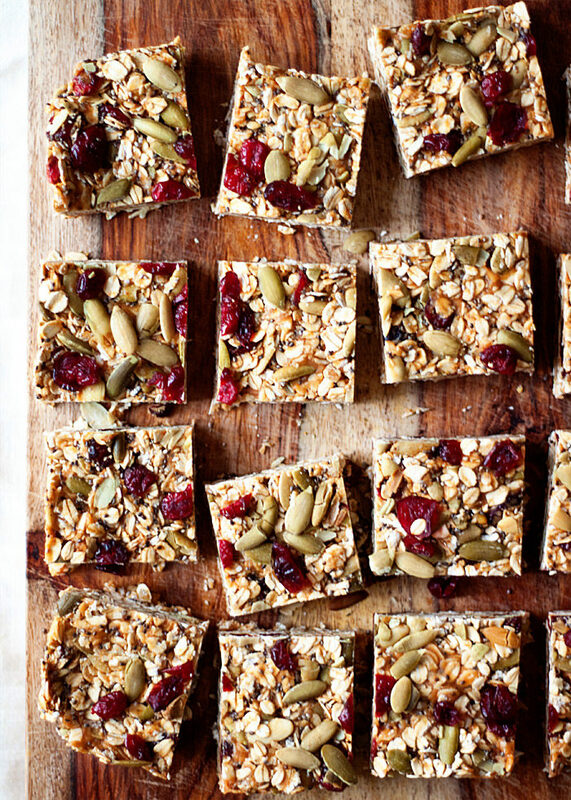 These morning glory breakfast cookies look mighty fine. A vegan hash like this one would be perfect for camping. I like to cook the potatoes and other long-cooking veggies beforehand, then just bring them in an airtight container to finish up in the skillet. We usually keep lunch super-duper simple. We’re doing fun stuff all day long – who wants to stop and labor over lunch for hours? Not us! Sandwiches are the name of the game here. Nothing that requires cooking. Fast, easy, delicious. Side benefit: Sandwiches also work extremely well for our multivore home – we can customize them to each person’s liking. Fake turkey slices, lettuce, tomato, a bit of vegan mayo, and mustard. Done and done. 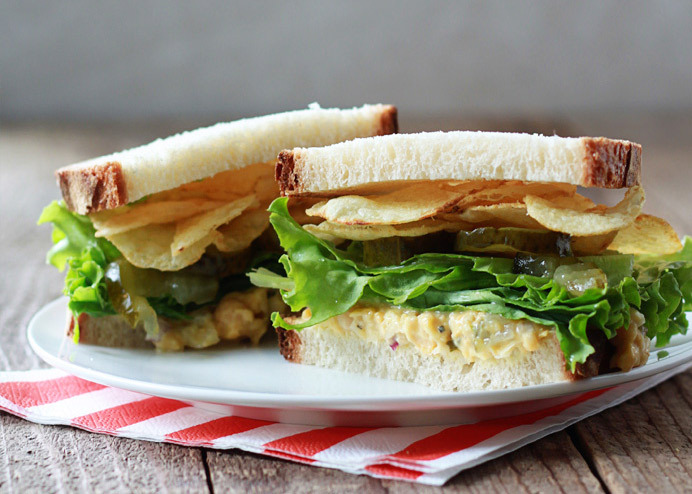 Chickpea salad sandwiches – make the filling beforehand and slap it on some bread when it’s time to eat. Easy! Tofu, Lettuce, & Tomato Sandwiches – make the tofu “bacon” beforehand and these are are cinch. Hummus and veggies. Make up the hummus and prep your veggies beforehand for an even easier lunch. This version (sans cheese) from Cooking Classy looks just about perfect. Going for the obvious here: trail mix. But seriously! Trail mix! Classic snack go-to hummus and veggies! So easy when you cut up the veggies before you head out. Gosh, there’s a lot you can do for vegan camping dinners. Some of our favorites are chili (and something called “Straw Hats” made with chili), pasta, veggie burgers, and veggie dogs.) Hobo packets are also pure vegan camping food awesomeness! Chili is an obvious camp dinner. Cook up a can and you’re done! You can also whip up a batch of the homemade stuff before you head out, too. Either way, it’s hearty and easy. Because my guy is a meat-eater, we generally bring a meaty variety for him and meatless for moi. Our favorite way to step up chili? Straw Hats! 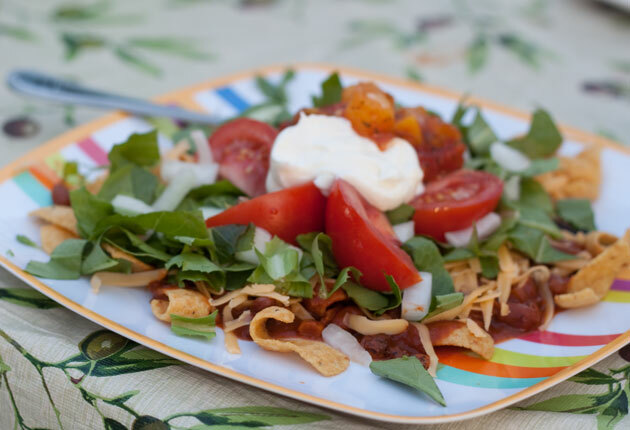 More commonly known as Frito Pie, Straw Hats are basically corn chips topped with chili and other good stuff like lettuce, pico de gallo, and diced avocado. Classy they’re not; tasty they are. We never go camping without making these! Whole wheat pasta tossed with previously prepared pasta sauce (like homemade Italian Tomato Sauce or Red Lentil Marinara). Easy! Just boil up the pasta on your camp stove, drain, and add it back to the pot with the sauce to warm it. Serve up with a steamed veg or side salad and you’re done! Obvious, but for good reason! Veggie burgers and veggies dogs are easy and tasty. Get store-bought or bring your own favorite homemade patty. Hobo packets – When you’re bound and determined to cook dinner over the campfire, hobo packets are where it’s at! Fill a foil square with veggies, veggie sausage, chickpeas, some sauce, and then fold and crimp the edges to seal. Cook over the fire, open, and eat it right out of the pack! Classy Vegan has a bunch of great ideas for hobo packets. Make up some vegan burritos, wrap them in foil, and cook them over the campfire! You could even make them before you head out. This recipe does call for cheese, but I’ve made them plenty of times without – still delicious. Stuff a pie iron with good plant-based stuff and cook it over the fire! I have yet to use one of these but it NEEDS to happen. There’s only one camping dessert that need be mentioned, right?! S’MORES! Marshmallows can be one of those gotcha foods that might seem vegan but aren’t – hello gelatin! Plus, many chocolate bars have dairy in them. And graham crackers sometimes have honey! So s’mores can be a minefield for vegans. But don’t be sad! There are vegan marshmallows out there, and they’re delicious. Many gourmet dark chocolate bars are dairy-free, and – bonus – they elevate s’mores like whoa. 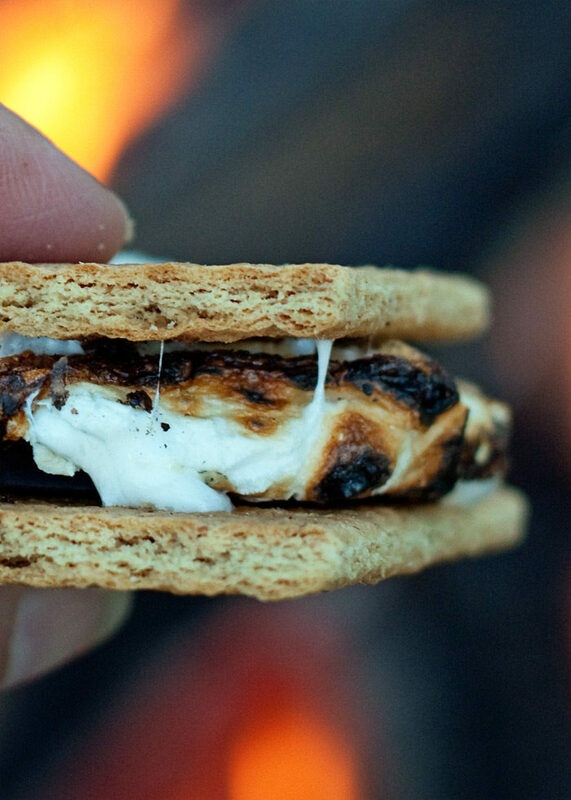 Grab a honey-free graham cracker and vegans, too, can partake in s’more-a-palooza! Are you armed with enough vegan camping food ideas now? Good! Now get out there! Add oats, almond milk, chia seeds, pure maple syrup, and peanut butter to an 8-ounce or larger mason jar. Stir well. Top with jam. Cover with lids. Refrigerate overnight or for at least 6 hours. Eat! I find these keep well refrigerated for 3-4 days. Be sure to use certified gluten-free oats if necessary. This is a sponsored conversation written by me in partnership with Silk, a brand I love! Thank you for supporting the companies who support Kitchen Treaty. 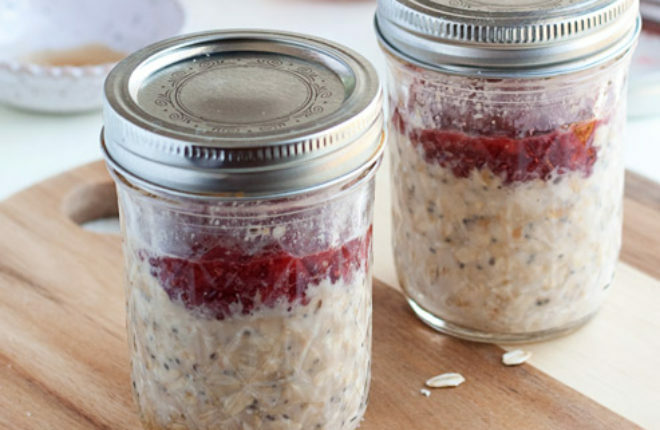 Can I use steel city oats for oatmeal jars? I’ve not tried it, but I do hear that steel-cut oats do indeed work in overnight oatmeal. If you try it please report back! I love vegetarian food and being a part of nature. Especially pasta and sauce, having it around the campfire is one of the best memory which I have ever had so far. Thank you for sharing and please keep it up. This is the best vegan camping post I’ve come across while googling. You privide for all meals and snacks and actually include recipes yay! Easy to cook yummy camping meal ideas. I must try a few of them in my next camp. Next Post » Quick & Easy Dinner: Individual Pizzas Any Which Way + Just Relax!